Comments - Fantastic depiction of the two great generals Takeda Shingen and Uesugi Kenshin at the Battle of Kawanakajima. 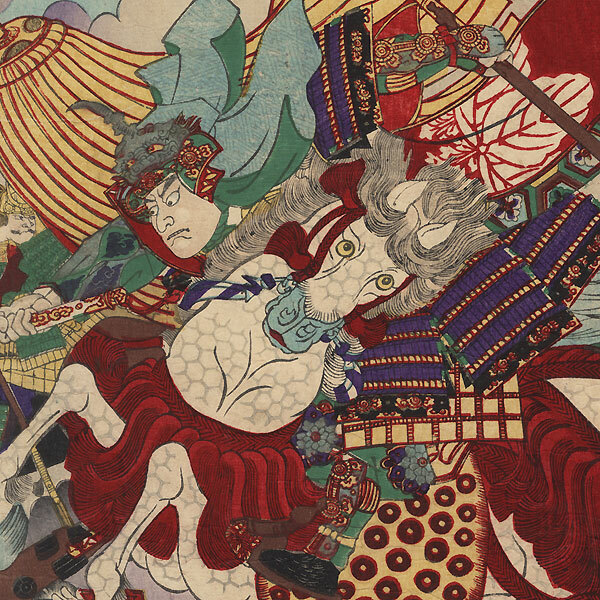 In the center, Kenshin charges ahead on a dappled horse, slashing at Shingen with his sword. Still seating on his folding camp stool, Shingen deflects the blow with his iron battle fan while reaching for his sword. The battle rages fiercely all around them on the banks of the river, as swords and spears clash. 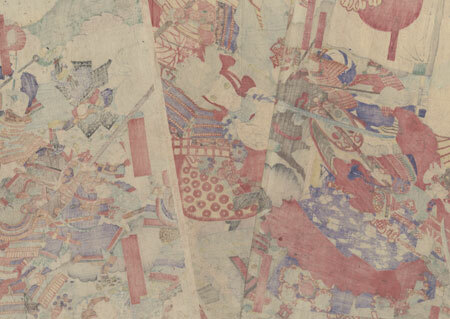 A dramatic scene packed with terrific detail, each warrior identified with a name cartouche, rendered in vibrant color. A large fringed standard at center is topped with what looks like a turnip, and the banner and standard at left feature the four diamond crest of the Takeda Clan. A great triptych illustrating the famous 16th century war between Kai and Echigo provinces. Condition - This print with excellent color and detail as shown. Three separate panels. Vertical folds. A couple small losses at edge, a few holes, repaired. Creasing and wrinkling, slight toning and soiling, a few stains. Please see photos for details.